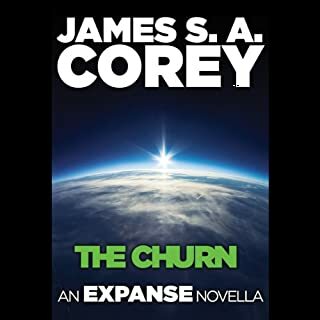 The first book in the landmark Expanse series, now a major television series from Amazon Prime! 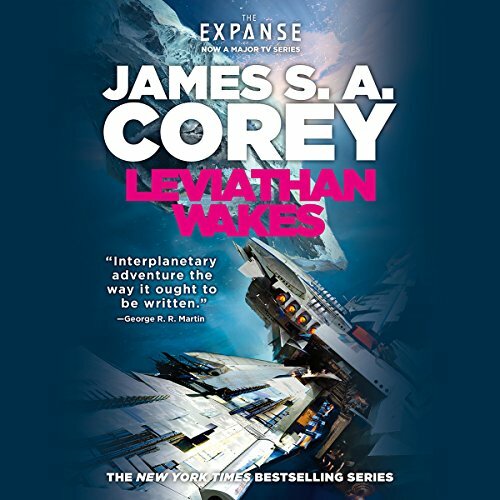 Leviathan Wakes is James S. A. Corey's first novel in the epic New York Times best-selling series The Expanse, a modern masterwork of science fiction in which humanity has colonized the solar system. 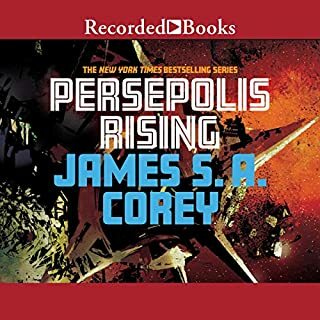 Two hundred years after migrating into space, mankind is in turmoil. 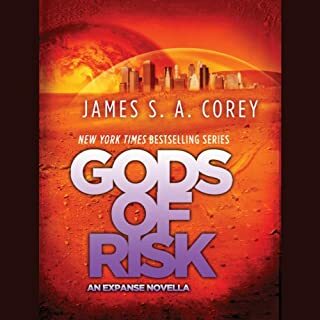 When a reluctant ship's captain and washed-up detective find themselves involved in the case of a missing girl, what they discover brings our solar system to the brink of civil war and exposes the greatest conspiracy in human history. Fantastic narrator and great story! Jefferson Mays was a fantastic narrator and made this a really great listen. The story was compelling and its characters were genuine and likeable. 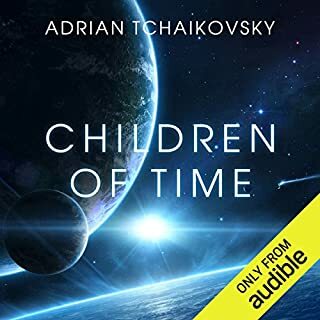 I would recommend this production to anyone looking for a space opera that will provide them with many hours of enjoyment! This is a thoroughly enjoyable science fiction tale of the future that is not based on the current, ever-popular dystopia. There is science, future generations, evil corporations, alien technology, off-world living, murder, mayhem, and mystery. 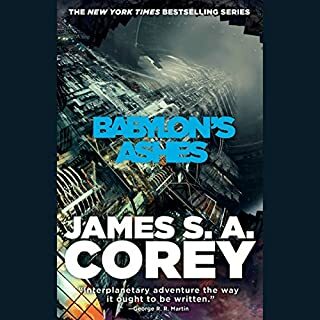 It is one of the best science fiction books I have "read" in a long time. The voice talent reading this book does an excellent job. Leviathan Wakes is an absolute breath of fresh air compared to the piles of generic sci-fi being released currently. 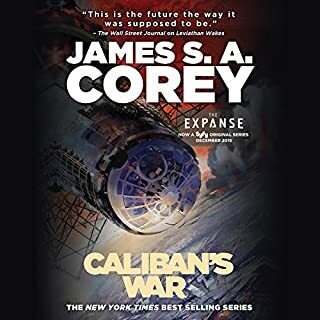 The first book in the expanse series sets up a near future landscape with an intense political triangle as well as cast of interesting and compelling characters working to solve a mystery that spans our solar system and more. Narrator mispronounced a lot of words. It was very distracting to listen to. Book is great though. Absolutely epic! A must read! 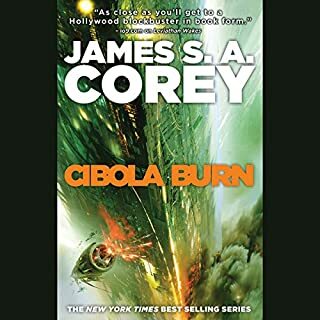 Highly recommended to any sci-fi fan. Has so many unexpected twists and turns that keeps you guessing what would happen next. 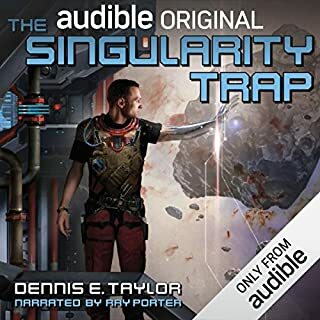 This audiobook was my first Audible experience and I enjoyed the spit out of it. I liked Jefferson Mays' narration and he has a pretty great range for voices, including female voices. As for the story? 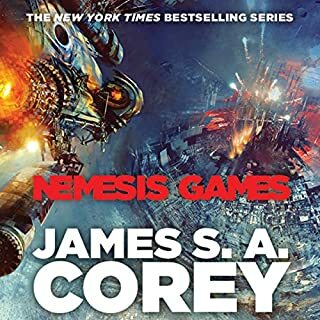 I'm caught up on The Expanse, and I'd read the books already, so I knew what was coming. Holden is a character that will never not low level annoy me, but I loved the Miller chapters and the grey morality. Looking forward to hearing the rest in the series! 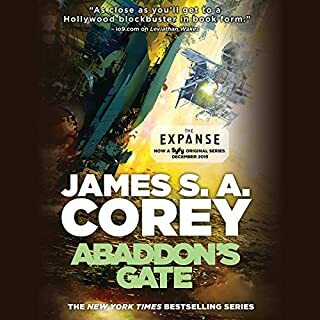 This is definitely one of the best sci-fi series ive read or listened to in a long time. The narrator does an amazing job. I would recommend this book to just about anyone. The world building and characterization is bar none. highly recommend. That is all I have to say I'm just reaching minimum. Wonderful cliffhangers, super well written and narrated. Getting book 2 now! This book had me in suspense, full thought, laughing and even slightly angry(in a good way) at times.. The characters were beautifully brought to life. 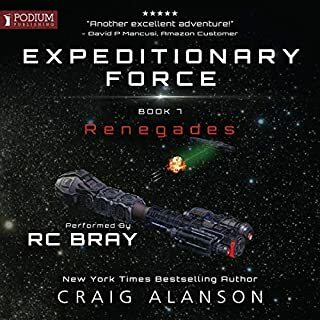 The series grows in both scope and character over the next few volumes in the series and becomes highly engaging over time. When I started this book I could NOT stop listening. The prologue opens with a hook and I HAD to find out whatever happened to Julie. 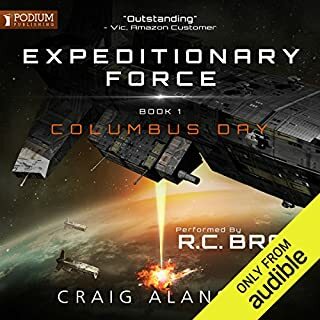 I appreciated that the story bounced back and forth from following Detective Miller for a space of time and then switching to following Holden and his crew. You got to see into their heads and their different points of view coming from very different backgrounds, which was cool. It was also interesting to see the different pieces of the puzzle fitting together, and exciting once their separate storylines finally converge. While starting out with a bang, for some reason about 3/4 of the way through I just got tired of this book. And then I'm looking at how many books are left in the series (5 more already published, and 3 more slated to be published in the next couple of years, not counting the 1.5 type inbetweener novellas) and I was left going &quot;Eghhhhh... Do I HAVE to finish this?&quot; I'm glad I plugged through, because the last hour or so picked back up again. I don't feel any need to read the rest of the series, though, and feel like this first book of the series can stand alone with the way it ends and not FORCE you to read the rest of the series - specifically, no cliff-hanger ending but instead wrapped up nicely enough that it can be left alone with enough open-endedness to segway into the rest of the series should you so choose. I listened to the Audible version narrated by Jefferson Mays, who did a great job narrating. I could tell which character was talking, and he managed to do a credible female sounding/feeling voice for the female characters that wasn't high/squeaky/awful like I've found a lot of men do. He also didn't read with the endless droning monotone that so many male fantasy/sci-fi narrators seems to bore me to tears with, so thanks, Jefferson Mays! 10/10 would listen to you again (but not this book again, sorry). If Dune, Babylon 5, Battlestar Galactica and The Moon is a Harsh Mistress had a communal baby, this would be it. Corey's descriptions of #SpaceLife and the people who live it are some of the most realistic I've ever "read." He clearly spent some time getting into the minds of people like those in his books, and wrote from a perspective that includes near-future analogues of 21st century blue collar workers, middle class families, and privileged persons. Exploration of high-level ideas of what politics might look like in the future and what practicalities would be needed to live in a place with no atmo vs small scale interactions between hard-working Belters and no less hard-working but obliviously privileged Earthers and Martians are what make Corey's world building so complete. The characters he writes are complicated and three-dimensional; his heroes have flaws, sometimes big ones. They might not even be heroes in the grand scheme of things. 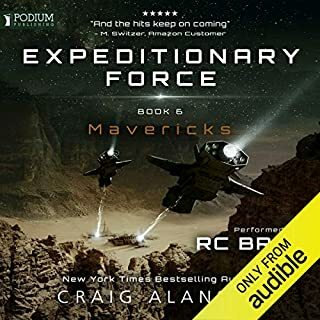 I really identified with Miller, and hoped (and still hope, since we're not sure if his story is over by the end of the first book) that he would find his place in the solar system, even if it wasn't with the crew of the Rocinante. My favorite "part" of the book is that the cast of characters is so diverse, culturally and physically. 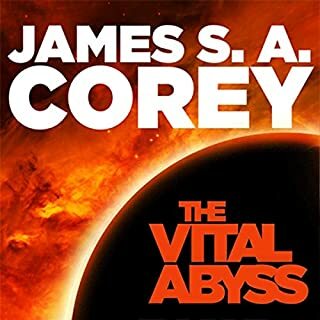 His fictional prediction of what it would be like to export various Earth cultures off-planet and the resulting anachronism between them paints a picture that shows long-term living in space as more than the sterilized metal hallways and fluorescent lights we're so used to seeing in "hard" science fiction. 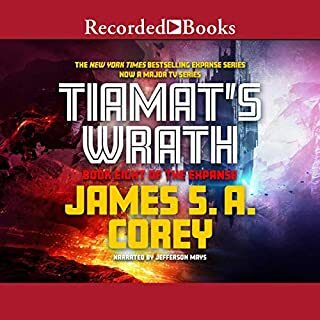 Jefferson Mays's narration of the beginning of this epic space opera is, at first, a little annoying in the clipped pronunciation of non-dialogue text, but that doesn't last long. He's got a great grasp of pronouncing the patois the Belters use, and is consistent with said pronunciation. The characters don't have wildly different voices, which I like. YMMV. I've never been a fan of the way some narrators use a soft, simpery voice for female characters, and Mays emphatically does not do that. Overall, I absolutely loved the book and the performance. I think it's the kind of book you could write papers about. I'm very much looking forward to the rest of the series. I was very surprised with this book as I came in with mediocre expectations. Everything fits together perfectly from the cold and hard sci-fi universe to the flawed but interesting characters. The pacing left me dazzled; Every time my attention started to wander the book steps it up and before you know it another hour of reading has passed. 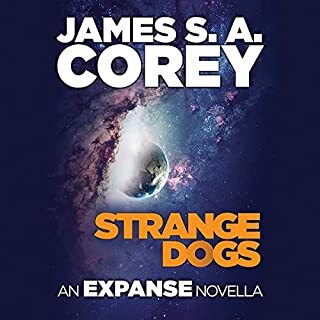 The big plot puncher really marries two genres in a way other stories have failed to, and it leaves you wanting to read the rest of the series. I fell in love with this book. It's one of those books like Hyperion or Use of Weapons that you wish you could read again for the first time. Jefferson Mays does a great job, and if you keep reading the series you will appreciate his consistency. Loved this book. Best stand alone sci fi series there is. Must listen. Watch the TV show too. so good. I'm so glad I started this series. The writers have done a great job setting up the world and its protagonists. It does not feel campy at all like some sci-fi. It definitely has a feeling of epic-ness to it. It can expand into so many well done characters and vast universe. Writing is smart and adventurous too. Highly recommend it to readers of GoT and Hyperion. The exploration of the world could be compared to Hyperion series. In the first book, there was not too much depth to the characters yet but a good start. The narration works well with the characters and the plot. I liked the transition from one character to another. Definitely looking forward to the TV series too. The author really does a good job of making the characters real. I still don't really know if I like either of the main characters but it works in this story. This book is slow and methodical but there is still so much going on. I might have thought it was slow because I finished Hell Divers right before and the pace of that book is very different. I wasn't at all bored though and it twisted and turned in ways I didn't expect. I will be getting the next book in the series. I really like the show better but I do like the book. It's very interesting well-written and of course the science is top-notch. Better than the TV show! 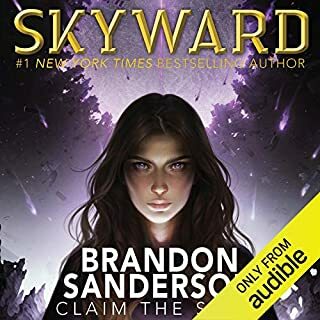 As a fan of the television show, after hearing that it was going to be cancelled, I decided to start listening to the audio books. 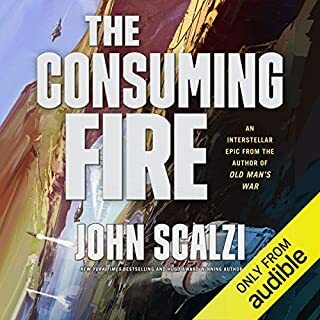 I'm very pleased to say the audiobook met my expectations. Well performed, and although the story was not a surprise, the subtle differences between TV show and novel kept it an enjoyable experience. I've always downloaded the second book in the series, and will continue with the rest of the series after that.